Switzerland's glaciers are melting. In less than 40 years, their surface has shrunk by almost 30 percent. Linked directly to an increase in greenhouse gas emissions, this relentless retreat can be observed around the globe, impacting negatively on the economy, the environment and society. As an Alpine country itself, Switzerland has always been engaged in mountain regions, which are too often marginalised, neglected, and afflicted by great poverty. It also conducts projects on the slopes of the highest mountain summits to help communities adapt to the effects of climate change or to prevent natural disasters. This commitment is crucial as the number of food insecure people in mountain areas rose 30 per cent over 12 years, while global hunger figures are declining. The Swiss Agency for Development and Cooperation (SDC), Switzerland’s international cooperation agency within the Federal Department of Foreign Affairs (FDFA), is also active at the international level: it played for example a key part in helping to draft Chapter 13 of Agenda 21, on sustainable mountain development, at the Earth Summit in Rio in 1992. This Global Brief* shows specific examples of SDC's activities with regard to glacier melt. You will read how Switzerland is recognised for its expertise in this field, thanks to its universities and to a dynamic and innovative private sector. *download from the right-hand column (English) or via the links provided under Further Resources (French and German versions). A description of what you will find in this Global Brief is provided below. Helps mountain populations adapt to the expected reduction in the availability of water as the glaciers melt. This includes constructing reservoirs to mitigate peri- ods when water levels are low, careful resource management, and making changes to agricultural practices. Supports data-gathering on glacier melt in various mountain ranges. This data will help achieve a better understanding of the phenomenon, and allow action to be taken to forestall its effects. 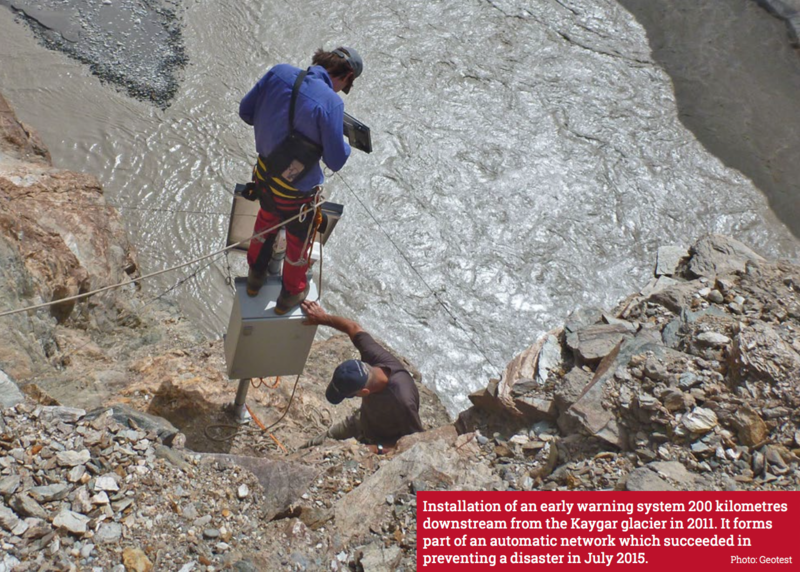 Helps to prevent disasters associated with glacial lake outburst floods (GLOF) by installing early warning systems. Based on Swiss expertise, these systems are an excellent example of collaboration between governments, higher education and the private sector. Pursues a range of activities intended to raise public awareness of sustainable development in mountain regions, such as the SMArt (Sustainable Mountain Art) initiative from the Valais-based Foundation for Sustainable Development in Mountain Regions (FDDM). Has been very active at the international level ever since the Rio summit in 1992. It also leverages a network of institutional partners in a number of regions around the world to promote sustainable development in mountain regions and to stimulate cross-border cooperation. Find out how climate change and glacier melt are impacting vulnerable mountain communities, and the importance of studying glaciers for making robust development and adaptation decisions. Switzerland maintains a number of links with Peru with regard to climate change, in particular melting glaciers. Thanks to collaboration between the universities of Zurich and Fribourg, a postgraduate training course in glaciology was set up at the Peruvian universities of Huaraz, Cuzco and Lima in 2012. There had been no courses dealing specifically with this topic before. Read the brief to find out more! Are disasters related to glacial lake outburst floods becoming more common and extreme? What are the main difficulties in studying glaciers and the effects of their retreat? Do the different disciplines involved in this field integrate data collection and the implementation of adaptation measures well enough? Christian Huggel, glaciologist and researcher at the Department of Geography of the University of Zurich, provides some answers! What triggers a glacial lake outburst flood, such as the one in the Kyagar Glacier in western China's Xinjiang province, cannot be fully explained. The consequences, however, are well known: a lake forms underneath the glacier, which blocks the water from entering the valley. But when this barrier is lifted, it releases a gigantic tidal wave that threatens more than one million people living 560km away in the plains of the Yarkan River, and causes losses equivalent to more than CHF 10 million every year.